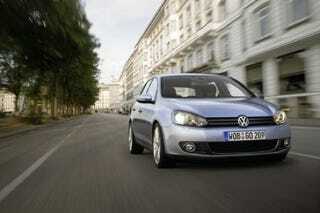 Volkswagen Tops Ford In Global Sales For First Half Of 2008, Shouts "We're Number Three!" Volkswagen put out a horn-tooting presser today touting their delivery of 3.31 million vehicle worldwide in the first half of 2008, versus Ford's 3.22 million sales. Those figures mark the first time ever that the kids in Wolfsburg have cracked the top three worldwide in sales, and VW is gleefully rubbing it in Dearborn's face, stating "rival Ford had to settle for fourth position." Enjoy it now, Volkswagen; there's still six months to go. Never underestimate the willingness of American automakers to offer $20,000 cash rebates just to beat you in the last two weeks of the year, even if it does mean receivership. USA! USA! Arrogantly German press release after the jump. VOLKSWAGEN OVERTAKES FORD Volkswagen Group in the fast lane: Wolfsburg automaker now holds third place in global vehicle sales ranking WOLFSBURG, Germany - The Volkswagen Group has taken its place among the world’s top three automakers thanks to the Wolfsburg-based company’s outstanding delivery figures in the first half of 2008. Rival Ford had to settle for fourth position. "We are delighted that the Volkswagen Group has made it to the global automobile industry’s top three for the first time. This shows that we are on the right track with our ever-stronger international presence and, above all, our product program. We will systematically push ahead with our growth course even in the present difficult market environment," Prof. Dr. Martin Winterkorn, Chairman of the Board of Management of Volkswagen Aktiengesellschaft, commented. With 3.31 million vehicles delivered in the first half of 2008, the Volkswagen Group increased deliveries in the first six months of this year by 7.2 percent, moving up to third place in the global vehicle sales ranking and overtaking its rival Ford, which announced vehicle sales of 3.22 million for this period.